Copywright Ellen H. Rice, Ocean View, Delaware, 2017. All rights reserved. ​This painting means more than I realized when I started it. It was conceived as an idea that came in prayer several years ago, but recently was brought into painted form in an unusual way. I didn't look for a model or imagine the woman standing in the ocean as I've done with some of my other Strength of Woman paintings. A new neighbor posted a photograph of herself on Facebook that was almost exactly what I'd seen, particularly its feeling. Quiet times of seeking, peace, gentle reflections, hope, trust . . . new beginnings. From the moment I put the original oil painting in my gallery to dry, it drew an unusually strong response. There have been lots of bright smiles and comments about how real it looks, and there have been teary eyes. To many, the draw is the painting's beauty and peace. They love the light going through the wave and surrounding the woman and say they can almost hear the ocean and taste the salt air. Others identify with the woman. When the latter tell me their stories, uncannily they mirror the story of my neighbor - and myself a number of years ago. The Bible passage above is what first spoke to me about Reflection. In some interpretations the word hope is used instead of trust. "In quietness and hope shall be your strength." I've come back to this verse many times over the years. When I moved back from the other side of the county to this one in 1994 after my husband of 28 years passed on, I spent countless hours on the deserted off-season beaches, thinking, seeking answers and most of all letting go. There's something about the ebb and flow of the tides that speaks of eternity, an eternity that exists now, that we are part of now and that we couldn't if we wanted to exist outside of, ever. The vastness of the ocean points to a power so much larger than ourselves - a power that is also something we cannot exist out of. 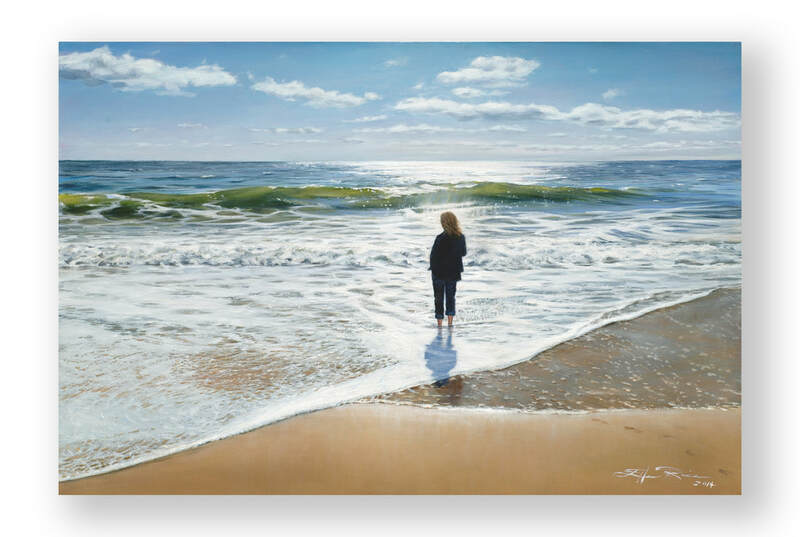 Here, at shore's edge, we relax, appreciate, commune, let our thoughts flow where they may, soak in the sun and are renewed. Like my other Strength of Woman paintings, this one seems to speak individually to people from the life experiences they are coming from. Amazingly, almost every woman who has responded with tears to this painting is a widow, often a sudden widow, just as my neighbor became, just as I did, in a way, a few weeks after our divorce after 28 years of marriage. Sometimes it still amazes me that brushstrokes on canvas can convey so much, and this is one of those times. Bringing peace, joy, comfort, healing is the purpose of my women series. In truth, that desire is behind all of my work. Somewhere the Bible says that desire is prayer. A beautiful soul once advised me, "Ellen, always pray about what you're thinking while you paint. People will pick up on it." 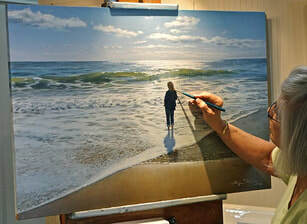 If this painting has drawn you, it may be offering something you need, whether it’s a happy reminder of calm beautiful, sunny days at the beach or a reminder of the fact that like the ebb and flow of the ocean, life is eternal, ever changing, so much larger than our limited human minds can conceive of, and each moment offers new beginnings if we only stop and open our eyes to that which is all around us.